White Pines golf course in Bensenville, IL East course with Bert and Brad Saxon, and Ron Hochheimer. used my 1 year old #8 iron JPX EZ with Dynalite gold xp steel shaft with 3/4" extension. Hole is over water and green surrounded by 2 traps. The ball landed about 10' left of the cup and rolled right toward the cup and whamo, my first hole in one . there must have been some side spin from the way the ball ran horizontally to the cup from our view. I shure do love these clubs..
6 days "old" JPX 850 Forged, so happy with my new equipment! 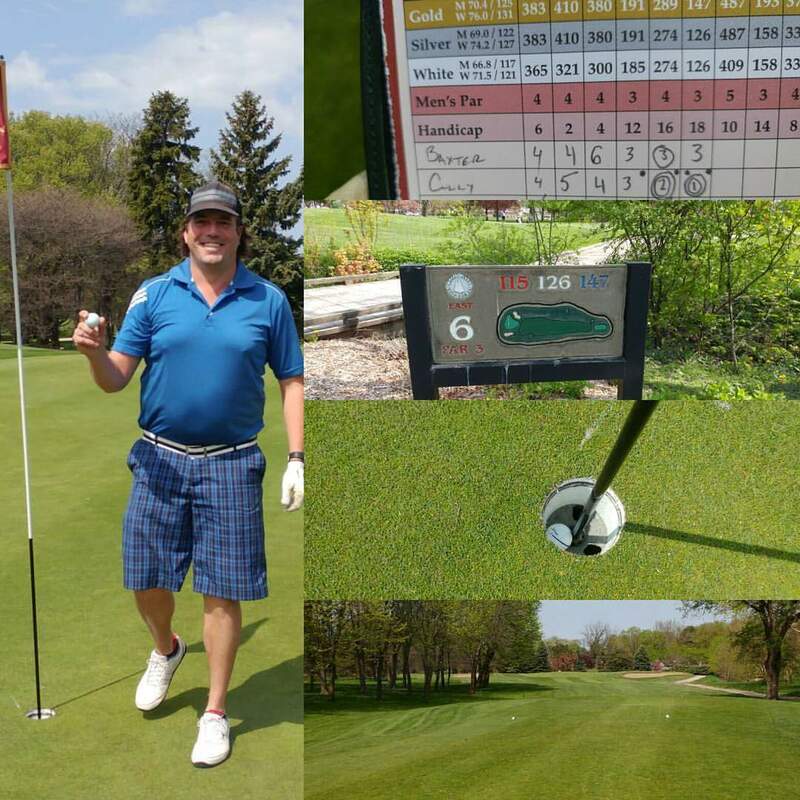 I made my sixth hole in one with a Mizuno iron on May 8th (Mothers Day) at my club Sand Creek Country Club. My long time playing partners Larry Krucoff and Bob Home witnessed my fete using a MP 64 9 Iron from 121 yards on our 4th hole on the Creek nine. My last three hole in ones have been made using Mizuno irons! White Pines Golf Course in Bensenville, IL. Went 5-4-3-2-1 on holes 2-6, holed out from 28 yards for eagle on 5 and then aced 6 (147-yd par 3) with 9i. Mizuno MP-63 irons (recently switched to MP-H4s though). Three witnesses -- Baxter Teal, Gino Brizuela and Ken Kaulen. Thanks for the pics. The eagle bit is a pretty impressive side story. I recorded my 1st hole in one on Tuesday 6/14/2016 at Spring Creek Golf Club in Zion Crossroads VA, #17 par 3 that measured 139 yards that day. I was playing in a weekly evening group with Steve, Bob, and Don when I put a nice move on my MP-69 PW and watched the ball hit just to the right of the pin and release into the hole! Steve was the first to say something but I didn't want to believe it until I saw the ball in the bottom of the cup. When we got to the green there were no other balls visible and my heart started beating faster. I looked in the cup and there sat the Titleist Pro V1x Folds of Honor logo ball I received just 2 weeks prior when Steve, another friend Gary, and myself took a trip to Myrtle Beach and made a donation to Folds of Honor while playing Caledonia Golf & Fish Club. What an awesome day. Had my second Hole in One on July 1st, 2016 at Langdon Farms Golf Course Hole 17 playing 177 yards with a 6 Iron. I am a left handed golfer who loves his MP60s, Mizuno wedges and Mizuno Scratch Sack! Witnessed by Keegan Reichert, Brian Lawson and Brent! I got my first hole in one on July 12, 2016 on the par 3 4th hole at the Groton Country Club, in Groton, Massachusetts. It was Tuesday night men's league and the hole was playing 145 yards. I hit a beautiful high draw with my 8 iron. My Titleist Pro V1 landed in front of the cup, released, and disappeared into the hole. Hopefully this opens the flood gates for more! I play Mizuno JPX800 Pros. Witnessed by my playing partner KC. Hit my first hole in one August 5, 2016 with a 6 iron Mizuno JPX 825 at Spring Valley Country Club in Columbia, SC. Number 13, 171 yards, pin tucked back left. Couldn't even see the hole. I will continue to hit Mizuno irons and have always been a huge fan. Luckily it was the Member Guest tournament so all the drinks we're already paid for anyways. Playing with my son and a costumer.. First time ether of even saw a hole in one !! !